Vizslas are a very unique dog. 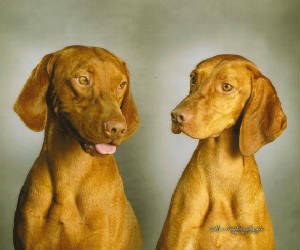 Vizslas are extremely loving and affectionate family dogs who want to be with the family, they are people oriented. We call them "velcro dogs" because they want to be with you all the time. Vizslas do best when they are in the house and are a part of the family. The Vizsla is an excellant companion and has a high level of intelligence. Vizslas LOVE to learn! They are clever with problem solving abilities. They love challenges and will thrive in an enriched family environment. Once you have had a Vizsla there will never be another dog for you. Vizsla's are one of a kind. Vizsla's are sporting dogs and love exercise. The amount of exercise depends on the age and size of your puppy. They are quite adaptable and will adjust to your routine, BUT our guarantee requires no strenous running or jumping until the puppy is 2 years of age. Because Vizsla puppies are still growing and their bones are developing, do not expect your vizsla puppy to walk for miles! You can do serious damage to a vizsla puppy by pushing beyond what they are capable of doing. Take into consideration the age and overall condition of your Vizsla before undertaking a serious exercise program. 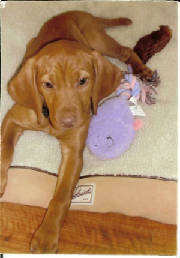 When training your Vizsla puppy or adult use firm, clear and consistent disciple. Out of all the sporting breeds, the Vizsla is one of the softer dogs. They do not do well with harsh training methods. To avoid confusing your new family member, everyone should use the same words to achieve the desired results. Consistency is a must in training your new vizsla puppy. Vizslas are eager to please if they understand what you want them to do. The Vizsla wash and wear coat calls for little more than a monthly bath. 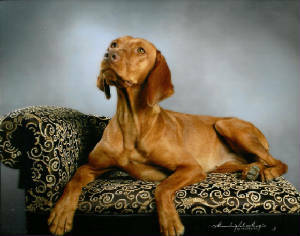 You can easily groom a Vizsla at home because of the short smooth coat and by using a hounds mitt to polish it weekly. A good mink oil is highly recommened to keep the shine in the coat. The toenails have to be cut back and ears have to be kept clean from debris. Bathing too often can be detrimental to their skin and coat. They do not have an unpleasant odor. All dogs shed, but the Vizsla's really do not shed much. With it's great nose stamina and affection for people the Vizsla is growing in popularity for search and rescue teams and as giude dogs for the sight and hearing impaired. As with other sporting and hunting breeds, Vizsla breeders are concerned about maintaining the breed standard. 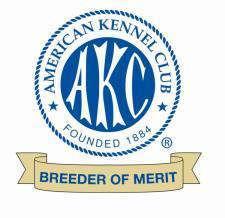 Most breeders only sell on limited registrations to avoid over breeding. If you are serious about having a show puppy and are ready to put in the time, training and financial responsibility that goes along with that, please let us know right away so we can pick out a puppy for you. Otherwise your new family member will be sold on a limited registration with the American Kennel Club. This means they will never be allowed to be bred or shown in confirmation events. You can still show them in agility, obedience and hunting competitions. 1. Thou shalt love thy master better than thyself. 2. Thou shalt be joyfully. 3. Thou shalt bite neither man nor dog without just cause. "My will not thine be done." Give us a call at 951-763-0433 or email at eveningstarkennels@gmail.com for more information on Vizsla Puppies or retired adult dogs.